What happens when a believer dies? What will heaven be like? What about infants and children who die? When do our bodies get resurrected? What will they be like? These questions and more occupy our thoughts from time to time. 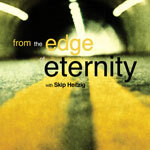 In this new series, From the Edge of Eternity, we will follow a believer from death into the different stages of eternity: the Intermediate State, the resurrection of the body, the Kingdom Age and the Eternal State. Since forever is a long time, it only makes sense that we both understand and prepare for this "ultimate journey".